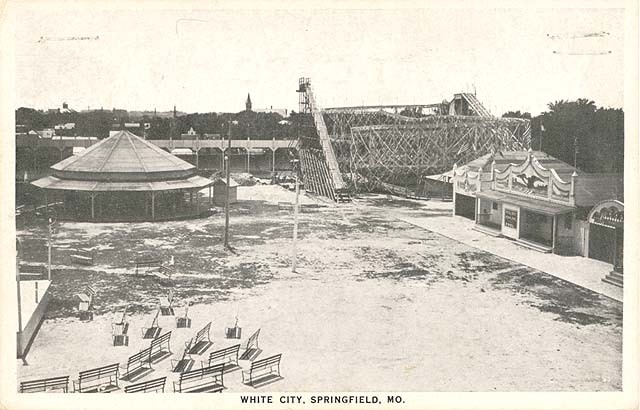 The controversial White City Amusement Park was constructed in 1907. Since it went out of business in 1912 this dates all four postcards to between 1907 and 1912. None of them were ever mailed. Central Park, as the White City area was originally called, was purchased by James T. Neville, R.C. Stone and Dr. F.W. Diemer in 1907. The area was enclosed by Campbell, Boonville, Division and Lynn. A huge amount of lumber and other building materials was purchased by the United Amusement Company of Springfield, Missouri, and the entire park was built in only a few short months. The amusement center included a roller skating rink (the largest in the United States at the time), a penny arcade, bowling, a large roller coaster, a vaudeville theater, a restaurant, a dancing pavilion and other attractions. This postcard also shows a merry-go-round, part of a bandstand and a pool hall. The "Dreamland" shown in postcards three and four was a garden area where couples could stroll and sit on the benches. The roller coaster is shown in the two black and white postcards. There was also a baseball field were Western Association games were played by the Springfield Midgets. The team moved to Doling Park in 1908 but were back in White City in 1909. There was no team in 1910 and the Midgets were back in White City in 1911, but then they were called the Jobbers. By 1911 there were only two of the many amusement park buildings left standing. The grounds were used for traveling circuses and carnivals and had an unsavory reputation. At some point the wooden bleachers of the original park burned and the stadium was rebuilt, with home plate being moved from the southeast corner to the southwest corner of the field. The new 3,000-person grandstand was opened in 1920. The Springfield Midgets were revived and played their first season game in 1920. In 1931 the St. Louis Cardinals formed a Class C team in Springfield, changing the name to the Redwings. The name was later changed to the Springfield Cardinals. That same year floodlights were installed so that night games could be played. Stan Musial started his career with the Springfield Cardinals at the White City stadium in 1941. The Knot Hole Gang was a club kids could belong to that would allow them entrance to games either free or at reduced cost. A member of the Knot Hole Gang had to agree not to skip school for games and not to use profane language. During World War II minor league baseball was suspended, and the Assemblies of God bought the 5-acre White City Park tract for $35,000. In 1948 the Gospel Publishing House was built facing Campbell. In 1961 a four-story office building was built on the Boonville side and became the headquarters of the Assemblies of God. Other buildings were added to the complex on the same tract of land. A story told by Ralph Harris of the Assemblies of God church is that in 1915 five teenage boys prayed to God to make the two-block area of White City His own because they thought it a place of evil activities. The area had been widely thought of as a place where nice people would not go. In 1945 their prayer was granted when the Assemblies of God purchased the land.